Nestled at the base of Blackcomb Mountain, Whistler’s landmark ski-in ski-out resort combines classic elegance with a modern alpine setting with full resort amenities. Surrounded by soaring mountain peaks, the majestic Victoria Glacier and a glistening emerald lake, the iconic Fairmont Chateau Lake Louise hotel is located in Alberta's Banff National Park, and is recognized globally for progressive environmental stewardship and responsible tourism. 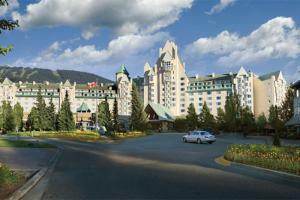 This 550 room luxury resort features breathtaking views of Lake Louise and the surrounding Rocky Mountains. Located at the base of Blackcomb Mountain in Whistler, British Columbia. The Wildflower - Casual Breakfast and Dinner, Portobello Market & Fresh Bakery, The Grill Room - Steak and Seafood, The Mallard Lounge and Terrace - Cocktails, Winter Alpine Dining at The Chalet - Hearty Alpine Cuisine. Peak 2 Peak Gondola, Whistler Mountain Bike Park, Squamish Lil'wat Cultural Centre, Sightseeing Tours, Lost Lake, Eco Tours.